Both Websites Are Now In Good Shape! 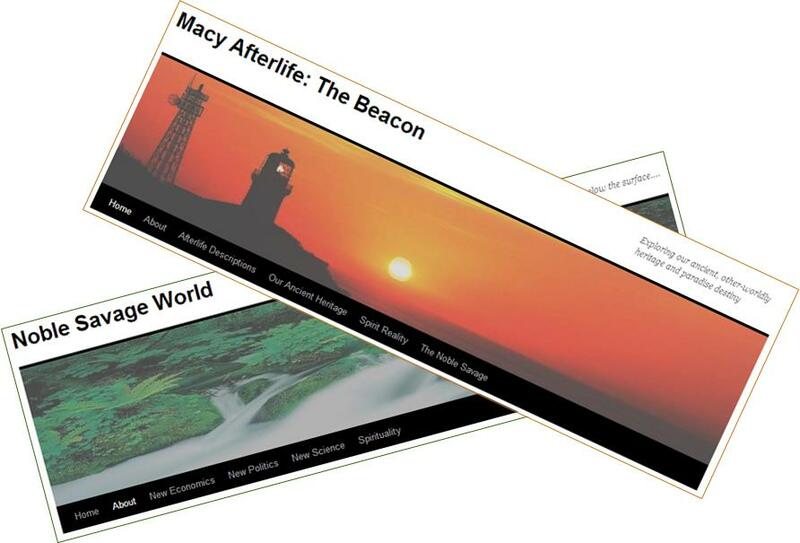 A couple of weeks ago this Macy Afterlife website was divided in two. It’s been a lot of hard work getting both sites in good shape… especially changing hundreds of links that were no longer valid… and had to be pointed to the new website. I’m sure there are still a few dead-end links scattered around, and I’ll be fixing them in the coming weeks and months as I encounter them. Meanwhile, both sites are ready for viewing. You’ll notice that this Macy Afterlife site has a new look, including a more modern masthead. I hope you like the look of the two sites, which are sort of like alter-egos or counterparts of each other. Macy Afterlife delves deeply into the other side of the veil… the worlds of spirit. Noble Savage World keeps its focus mostly on this side of the veil, but largely from a spiritual perspective. If you’re currently subscribed to Macy Afterlife, I invite you to go to Noble Savage World and sign up there as well. Simply click on the following link, and then once you’re on the new site, click on “Follow blog via email” in the navigation bar to the right. Thanks for your patience during this site’s transformation! 5 Responses to Both Websites Are Now In Good Shape! Congratulations on redoing the websites. Thank you Mark for making these 2 distinct and valuable offerings. I look forward to your writings. Congratulations Mark! Thank you so much for continuing your terrific contributions in both fields!